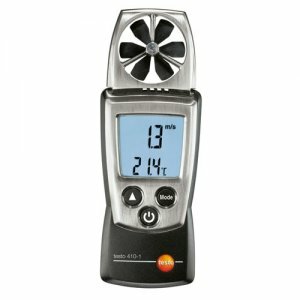 The Testo 410-1 is a vane anemometer with integrated NTC air thermometer. It is small, handy and easy to operate and is pocket sized, so it can always be transported with you for when you need it. The Testo 410 1 is ideal for measuring general airflow or when monitoring more specific HVAC conditions. Utilizing Testo's professional grade sensors, producing inaccuracies is uncommon in a meter this size. The menu-driven three button design allows for easy selection of the meters function. 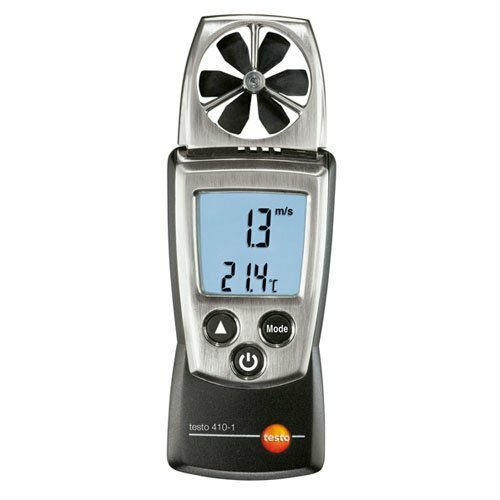 The Testo 410-1 model features air velocity, ambient temperature, Min/Max/Hold, select velocity and temperature units, large backlit display, wrist strap and belt holder. The unique hard shell protective cap snaps on and off the meter. When in use, the cap fully encases the meter, protecting everything including the display screen allowing complete protection from the elements. The 410-1 comes included with a wrist strap, belt clip, protective cap, and 2 AAA micro batteries.